This is a beautiful dish for any weather, dainty enough for the summer yet warming and hearty for winter, too. Low in calories and starchy carbs, this light chicken meal won’t leave you feeling sluggish. 1. Preheat the oven to 190°C (fan). Chop the herbs and mix together with the butter. Carefully spread the mixture under the skin of each chicken breast. 2. Roast the breasts for 30-35 minutes, or until there are no pink juices remaining when a skewer is inserted into the thickest part. Try not to overcook as the meat will dry out, and the chicken will cook a little more in the final steps. 3. When the chicken is almost cooked, heat the stock in a large sauté pan. Add the peas and broad beans and cook for five minutes or until just tender. Transfer the chicken from the oven to the pan. 4. Cook 3-5 minutes more, then add the lettuce. Cook one minute more, add the spring onions and give a quick stir. 5. Ladle the veggies and broth into a shallow bowl, top with the chicken and sprinkle with additional herbs, if liked. Serve immediately. 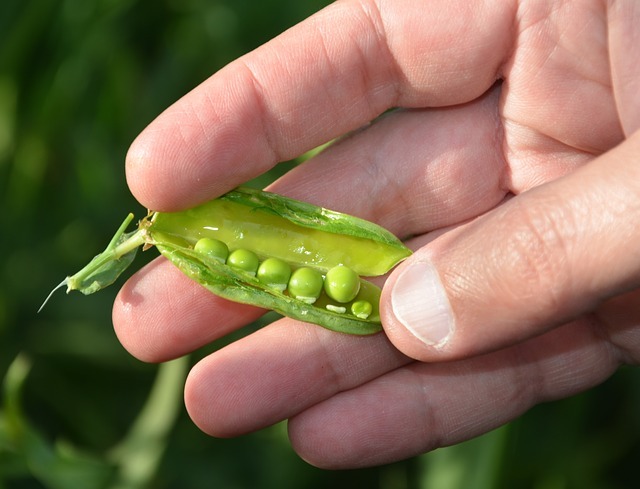 Our featured ingredient, peas, are a great source of vitamin K, which plays an important role in building strong bones. However it can also help to prevent heart disease, plus it plays a part in a variety of other bodily processes. Green peas are a great source of vitamin K, which plays an important role in building your bones. It is also known to aid in the prevention of heart disease, as well as helping in some other bodily processes. Green peas also contain manganese, which is an essential nutrient that plays a role in a variety of chemical processes within your body. It helps to process cholesterol, protein and carbohydrates. It is also believed to play a role in bone formation. A dietary fibre, green peas are also a source of vitamin B1, vitamin C, phosphorus, copper and folate. Additionally they contain vitamin B2, vitamin B6, niacin, molybdenum, magnesium, zinc, protein, iron, choline and potassium.